Ballyvaughan, in the old parish of Drumcreehy, takes its name from BAILE UA BHEACHAIN, OBeahans or OVaughans residence. The old castle of Ballyvaughan stood on the very edge of the harbour. It was always an OLoghlen stronghold, except for a short time during the sixteenth century when it was held by the OBriens. Apparently, in 1540 a stolen cow was located here, resulting in heavy penalties being paid by the OLoghlens. The fines included cattle, goats and sheep, as well as losing the town of Ballyvaughan. In 1569 it was attacked and taken by Sir Henry Sydneys forces but somehow the OLoghlens survived within their old territories. By 1840 the castle was a ruin but its foundations can still be seen today on a spur of land opposite the Rent an Irish Cottage scheme. Before the present village grew, a late medieval settlement seems to have existed here on this semi-promontory around the cottages. Westropp, in 1900, wrote "three small forts and a much levelled ring of a great Caher lie near the quay". This was shown on the Ordnance Survey map as a moated rectangular site. A small ring fort survives behind the end cottages and a preservation order has been placed on the surrounding fields. In the early years of the nineteenth century the Quays established Ballyvaughan as a fishing village. Three of the old piers lying north and north-east of Dr. O Deas Clareville House were built by the inhabitants of the village. At high tide they are virtually unusable as they are generally covered by several feet of water. This factor probably led the Fishery Board to erect a new quay in 1829. By 1831 the village contained 23 houses and by 1837 some of the inhabitants were engaged in the herring fishery which was then carried on successfully on this coast. By 1837 the inhabitants were looking for a new quay to "add to the prosperity of the place, as, independently of the fishery turf is landed here in great quantities from Connemara for the supply of the neighbouring country." They must have got it as the pier beyond the Irish Cottages is still referred to as the "New Pier". The road into it was built strictly for that purpose whereas all the other piers, including a few to the west between it and the site of Harbourhill House, were more readily accessible from the existing roadway network. The village had a population of 235, living in 35 houses, by 1841. 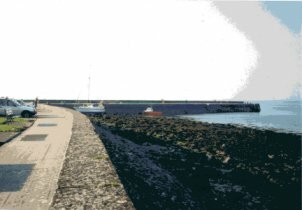 The quay was vital to Ballyvaughans existence. Most supplies came from Galway and the inhabitants exported all their grain, bacon and vegtables. For a while Ballyvaughan was the official capital of north-west Clare. It had its own workhouse, coastguard station and a large police barracks. McNamaras Hotel on the shore featured in many nineteenth century guide books. A herring fishery and oyster bed were operating successfully. However, as early as 1804, Dutton mentions in his writings that the oysters had become scarce for want of stocking the bed. As the roads improved and the piers deteriorated Ballyvaughan lost its importance as a fishing port. Today the piers are used mainly for pleasure craft and for charters to Galway or the islands. The old national school of 1854 has recently been restored and was officially opened as a community hall by President Mary Robinson in 1992. Nearby is a low cut - stone building which served as an auxiliary workhouse during Famine times. It later became the dispensary and medical committee rooms. The present Catholic church was built around 1860 and a small Church of Ireland church was erected on the Kinvara side of the village. When the latter church closed it was dismantled and brought to Noughaval where it was re-erected as a Catholic church and re-dedicated in 1943. In 1872, Lord Annaly built an artificial reservoir on a hillside to the south - east of Ballyvaughan to serve the farming community in the valley. The reservoir is fed by two springs and the water is distributed through a system of pipes in the normal manner. The scheme was extended by the Board of Guardians to the centre of Ballyvaughan under the Public Health Act of 1874, the water being conveyed by gravity in cast-iron pipes laid in crevices in the rock or above ground. A fountain was erected in the village in 1875 by two Connemara stonemasons, the Coyne brothers, who were marooned in Ballyvaughan when their craft sank at Gleninagh pier. A number of plaques on the fountain record the names of those involved in providing Ballyvaughan with one of the earliest reliable public water supplies in the country. The Rent an Irish Cottage scheme started in the late 1960s. Statutory and community groups came together to build traditional Irish style cottages for rent within the Shannonside region. The cottages are comfortable and while they retain many of the traditional features they also possess every modern convenience. Today, Ballyvaughan is a thriving tourism centre with a definite air of prosperity. Its situation, the surrounding attractions, the emphasis on crafts and the general upsurge of interest in the Burren have all helped.